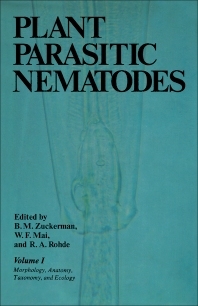 Plant Parasitic Nematodes, Volume 1: Morphology, Anatomy, Taxonomy, and Ecology is a masterful reference work in nematology that also includes information about ultrastructure, enzymology, and chemistry of body composition; culturing; virus transmission; biological races; and nature of plant resistance. This volume includes a discussion of the history and development of plant nematology, the status of research on this field, and information pertaining to professional societies and publications. It also discusses nematode morphology, anatomy, taxonomy, and ecology, including the origin of plant nematodes and population dynamics. It features drawing examples of free-living and animal parasitic nematodes. This treatise is written to provide an up-to-date reference source for students, lecturers, and research professionals in plant parasitology, specifically nematology, and related fields.